One of the strongest personalities in the club since he joined in 1986, Mally has been First Team, A Team, Sunday, Midweek and C Team skipper and, having recently gained his Level 2 Coaching qualification, is now heavily involved in coaching. He is also assisting Andrew Fearne as the club pilots a scheme to offer cricket coaching to youngsters with disabilities – the ‘Invicta’ group. Well known in Norfolk football and cricketing circles and, formerly landlord of the Eaton Cottage pub on Unthank Road, ‘the mower’ is a mighty striker of a cricket ball. 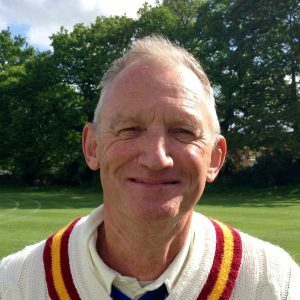 He has enjoyed something of an Indian summer as, since his maiden century in an A Team match at Swaffham in 1999, he has scored two more, including a superb club record 191 not out at Brooke at the beginning of 2003 which won him the ‘Mercury’ Newspaper Batsman-of-the-Year Award and the club’s ‘Aldous Special Award’ for the best performance. 9th in the overall appearance list, in 454 matches he has scored 8896 runs at an average of 24.77, taken 86 wickets, 185 catches and 11 stumpings. His biting sarcasm as reduced many an over-inflated ego and his guitar playing and jokes are legendary. His impersonation of a down-and-out on the streets of Oxford, his disruption of the card school and the picture of him crouching over a pile of horse manure on the same Oxford Tour, are never-to-be-forgotten moments in club history. He was Clubman of the Year in 1991, 1992 and 1995, A Team Player of the Year in 1990, 1992 and 2000 and Norfolk League Division 6 Batsman of the Year in 2000. Having decided to retire in 2005, Mally found the lure of the game too much to resist and has been back in action since 2006, first as B Team vice-captain and, for 6 seasons as skipper of the C Team, leading them to promotion in 2011 when he again topped the batting averages with 38.6. Certainly no shrinking violet, Mally often organises the workforce on Cricketforce Day and will certainly let you know if you’re not pulling your weight! He doesn’t play quite so often these days but, thankfully, he is still heavily involved at the club where grandson Aiden Button is a junior member.